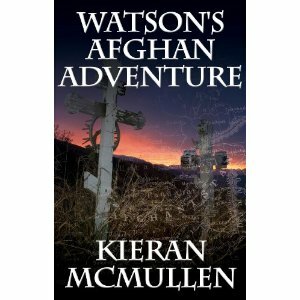 I just finished reading Watson’s Afghan Adventure by Kieran McMullen and I thoroughly enjoyed this book! It was well written, well researched, and made me feel like I was there with Dr. John Watson while he was serving with the British Army. The book, written as a recollection of Dr. Watson’s to his friend and colleague, Sherlock Holmes, starts when Dr. Watson just misses the visit of his former army orderly. This unexpected visitor leaves behind several strange gifts, and when Sherlock Holmes is allowed to see the gifts, Watson finds himself telling Holmes the story of part of his past that had never been shared before. More than the story of an army surgeon on campaign during the Afghanistan wars, it is a story of friendship, camaraderie, intrigue, treasure, revenge, and murder. McMullen’s style of writing, coupled with his background in the US Field Artillery, takes the reader into the past and shows what it was like for an army surgeon in the late 1800s during the conflicts that led to the battle of Maiwand. McMullen’s well researched book shows what it was like for the British soldiers and officers alike as they marched from India to quell the local tribes in Afghanistan and prevent Russia from threatening the British interests in the region. The peculiarities of the British command structure and it’s less-known cultural norms, as well we how the British class system led to poor decisions that would later impact the army’s battlefield performance, are detailed as McMullen tells the intertwined stories of a group of friends looking for a lost treasure in the middle of a war for which the British are hopelessly outnumbered. McMullen is an outstanding story-teller who breathes new life into characters, who are well know already, while presenting a fascinating tale of the fortunes of war that ultimately led Dr. Watson to meet and begin helping Sherlock Holmes solve the mysteries that have been thrilling readers for decades. I highly recommend this book to anyone who loves Sherlock Holmes mysteries and/or who wants to know more about the British soldier’s life during the late 1800’s. For someone that doesn’t follow the wars of Queen Victoria or know much about firearms or the military; the story is still a good read and keeps you wanting more. McMullen is able to make the reader feel they’re right there standing behind the characters.